The reality of a Richard D. Thomas painting doesn't lie so much in the details of the artist's rendering as it does in the honest strength and spontaneity that is inherent in his work. 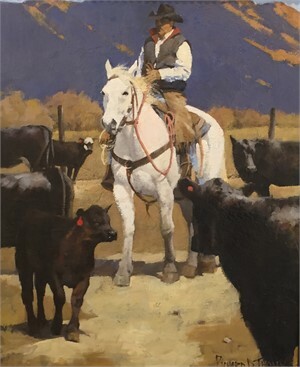 Viewing his paintings is much like being there—feeling the crisp snow crunch under your boots, smelling the fall leaves and listening to the gait of your horse. 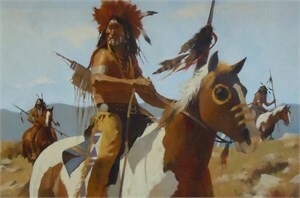 Anyone in love with nature and the western way of life can identify with Thomas's work. Thomas believes an artist must experience and fully understand his subjects before he can relay the truth of the scene to the viewer. He often paints on location and uses photographs for exacting details. An impressionistic quality keeps the viewer in touch with the real intent of Thomas's work-the focal point. Thomas paints as we see, and through his style, paints what he wants us to see. Thomas believes saying more with less and knowing when to stop are two important points for an artist. "You have to bring a painting to the extent your personality and temperament will allow-and learn when to stop. You don't want to make it too pretty." Thomas uses an impressionistic style, striving for feeling rather than detail by using light, color and texture to create the desired mood. Like all artists, Thomas is sensitive to his audience. But unlike some, he is in search of reaction, good or bad. "I really like to hear people say 'I feel like I've been there' even if they didn't enjoy being there," he says. Thomas's subjects come from his surroundings. 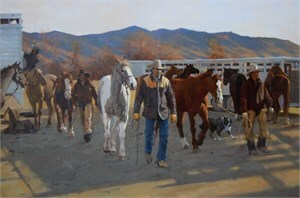 Many of the ranchers from his home area show up in his work. 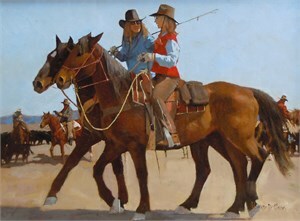 He also paints many of the landscapes and backgrounds on location He paints mainly western subjects--horseback riders, horses, cowboys, Native Americans and landscapes. A professional artist for many years, Thomas feels that art and life are a continuous learning process. "There is always something to learn...there is no final attainable goal in art. It's always just a little out of reach, just enough to keep you going. And that's fine with me because I intend to keep painting for the rest of my life. I have no retirement program in mind." He also feels that art is a direct reflection on canvas of an artist's sense of life. "A painting is an expression of what goes on around an artist. You can't hide anything. You're in there." The reality of a Richard D. Thomas painting doesn't lie so much in the details of the artist's rendering as it does in the honest strength and spontaneity that is inherent in his work. Viewing his paintings is much like being there—feeling the crisp snow crunch under your boots, smelling the fall leaves and listening to the gait of your horse. Anyone in love with nature and the western way of life can identify with Thomas's work. Thomas believes an artist must experience and fully understand his subjects before he can relay the truth of the scene to the viewer. He often paints on location and uses photographs for exacting details. An impressionistic quality keeps the viewer in touch with the real intent of Thomas's work-the focal point. Thomas paints as we see, and through his style, paints what he wants us to see. Thomas believes saying more with less and knowing when to stop are two important points for an artist. "You have to bring a painting to the extent your personality and temperament will allow-and learn when to stop. You don't want to make it too pretty." Thomas uses an impressionistic style, striving for feeling rather than detail by using light, color and texture to create the desired mood. Like all artists, Thomas is sensitive to his audience. But unlike some, he is in search of reaction, good or bad. "I really like to hear people say 'I feel like I've been there' even if they didn't enjoy being there," he says. Thomas's subjects come from his surroundings. 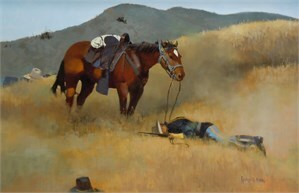 Many of the ranchers from his home area show up in his work. 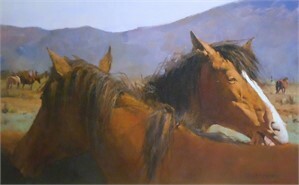 He also paints many of the landscapes and backgrounds on location He paints mainly western subjects--horseback riders, horses, cowboys, Native Americans and landscapes. A professional artist for many years, Thomas feels that art and life are a continuous learning process. "There is always something to learn...there is no final attainable goal in art. It's always just a little out of reach, just enough to keep you going. And that's fine with me because I intend to keep painting for the rest of my life. I have no retirement program in mind." He also feels that art is a direct reflection on canvas of an artist's sense of life. "A painting is an expression of what goes on around an artist. You can't hide anything. You're in there."